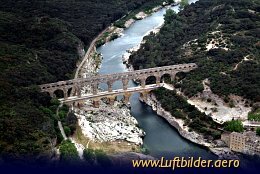 The Pont du Gard is an aqueduct in the South of France constructed by the Roman Empire in the 1st century. Built on three levels, the Pont is 49 meters high and 275 meters long. Its construction is attributed to Augustus son-in-law Marcus Vipsanius Agrippa. It was designed to carry the water to the Roman city of Nemausus (Nimes).